LD 9 and LD 10 cohost the Annual St. Patrick’s Day Celebration fundraiser. This is the annual campaign kick-off event for Southern Arizona. 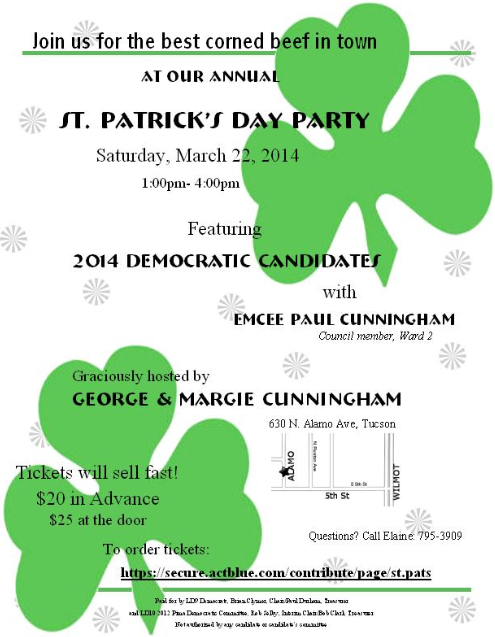 Come meet the candidates and socialize with your fellow Democrats. Several of the statewide candidates have already confirmed, joining Pima County legislators. Tickets are $20 in advance (today! ), $25 at the door. To order tickets secure online go to: https://secure.actblue.com/contribute/page/st.pats. For more information please contact Elaine Lim at (520) 795-3909.